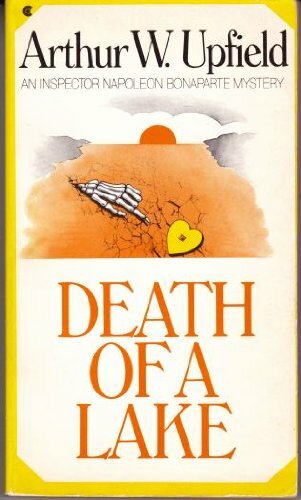 For the third time I’ve chosen an Arthur Upfield novel with which to participate in Crimes of the Century, this month requiring a novel originally published in 1954. Once again I chose to listen to a version narrated wonderfully by Peter Hosking (who’s won a narrator of the year award in his time and it’s not hard to hear why). Lake Otway was dying. Where it had existed to dance before the sun and be courted by the ravishing moon there would be nothing but drab flats of iron hard clay and then the dead might rise to shout accusations shouted by the encircling sand dunes. Three years ago the lake was so full of water that it was possible to swim in. And even to drown in, as apparently happened to young stockman Ray Gillen. But now, as police Inspector Napoleon Bonaparte arrives on the scene in the guise of a horsebreaker, the lake is rapidly emptying and Bony soon realises he’s not the only person keen to see what the disappearance of the lake will reveal about the stockman’s death. Gillen was a lottery winner and almost everyone connected to the station seems to think they have some claim on the dead man’s money, wherever it might be. I’ve thought before that the Upfield plots are the weakest elements of his novels but this one was strong, managing not to get bogged down in too much esoteric detail and maintaining a cracking pace with a load of twists as Bony – and readers – whittle down the greed-driven suspect pool. Whether it be the motley collection of fellow workers or the mother/daughter cook and housemaid team that look after the station everyone seems to have had both motive and opportunity to take advantage of the scenario. The culprit, when eventually unveiled, is among the coldest human beings you’ll encounter fictionally. Although there is much to anchor this book to place – including a heat which literally has birds dropping from trees in death and the kind of mass rabbit skinning that I can’t imagine happening anywhere else – there is not a great deal to pinpoint the novel in time. Mention is made that Ray Gillen had fought in Korea and there are one or two other indicators that this is one of Upfield’s later novels but it does have a fairly timeless quality. At least it does if you ignore the casual bigotry that pervades all these stories (though here it is women rather than Aboriginal people who cop the brunt of the social stigmatising). 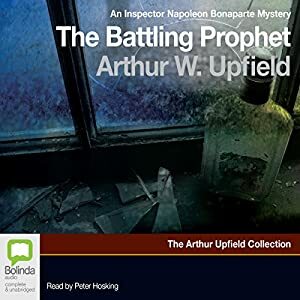 I don’t know that I’d recommend this as the best place to start discovering Arthur Upfield and/or Inspector Napoleon Bonaparte but the book is a solid entry to the series and continues to provide a unique voice in classic crime fiction. Why was the redoubtable King Henry, an aborigine from Western Australia, killed during a thunderstorm in New South Wales? What was the feud that led to murder after nineteen long years had passed? And who was the woman who saw the murder and kept silent?This first story of Inspector Napoleon Bonaparte, the half-aborigine detective, takes him to a sheep station in the Darling River bush country where he encounters those problems he understands so well… mixed blood and divided loyalties. 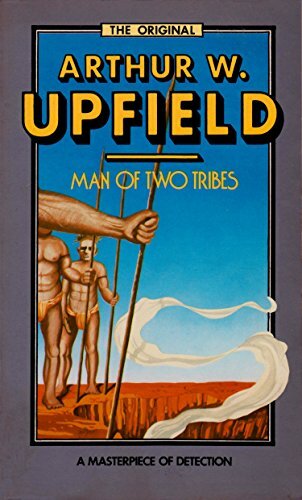 PLEASE NOTE: Part of the appeal of Arthur Upfield’s stories lies in their authentic portrayal of many aspects of outback Australian life in the 1930s and through into the 1950s. These books reflect and depict the attitudes and ways of speech of that era particularly with regard to Aborigines and to women. In reproducing this book the publisher does not endorse the attitudes or opinions they express. It would be easy to focus in a review of THE BARRAKEE MYSTERY on the politically incorrect (by today’s standards anyway) attitudes and terminology. But as the publisher says, they reflected the attitudes of the times. Peter Hosking does a wonderful job of the narration and that allowed me to reflect on other things: the descriptions of the outback and the toughness required of those who chose to live there. I was struck also by how the novel reflected Australia’s bush heritage. The bush heritage that I am reminded of were the works of Banjo Paterson and particularly the stories of Henry Lawson, even SUCH IS LIFE by Joseph Furphy. 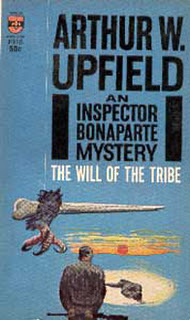 In later novels Upfield wasn’t as expansive in his descriptions of the country, and focussed more on detective/crime elements, but there are a lot of mini-stories in THE BARRAKEE MYSTERY. There is a mystery element in the novel too, well structured, but not really all that difficult to solve. 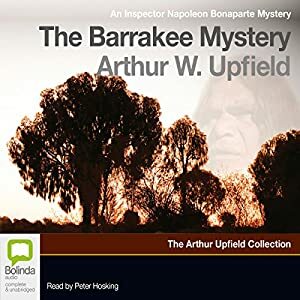 If my future self had been able to travel back in time and tell twenty-something Bernadette that I/she would one day fall back on Arthur Upfield as a reliably decent read I/she would have laughed in my/her face. I used to pontificate – as only a twenty-something who believes they’re the first to uncover the political and social inadequacies of earlier generations can do – that Upfield’s work should be consigned to history for its confrontingly wrong-headed depictions of race relations in Australia. But as a regular participant in the Crimes of the Century challenge, which requires the reading of a book published in the nominated year, I’ve had a rough couple of months (with my inaugural and lacklustre reading of a Dorothy L Sayers novel then the truly, deeply awful I, THE JURY by Mickey Spillane) and this month I wanted to at least enjoy the story. Older (much, much older) Bernadette has discovered that not everything is as black and white as my/her younger self believed and that Upfield still has something to offer. Further, in the context of wondering when we will ever get our indigenous relations up to scratch, it doesn’t hurt to be reminded how far we have come. 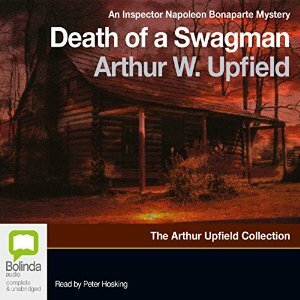 And so my 1945 book is DEATH OF A SWAGMAN: Upfield’s ninth novel to feature half Aboriginal, half European police inspector Napoleon ‘Bony’ Bonaparte. In this installment Bony has inveigled himself into the investigation of a death in rural New South Wales after having recognised a possible clue in a photo of the death scene. It is nearly two months since the stockman, George Kendall, was found dead but even so Bony slides into the case in a sideways move rather than hurrying to sort things out. He arrives in town with no fanfare and in something of a disguise so that he can get himself arrested and have an excuse to stay in town to question and observe the locals without them being wary of his official, and somewhat famous, status. …the hut faced toward the east across three miles of open country falling gently to the foot of the Walls of China. Here and there were giant red claypans, hard as cement and separated by narrow ridges of loose sand. Old man saltbush were scattered about the scene, and widely spaced water gutters, now dry, zigzagged slightly to the northeast to join a dry creek bordered by box trees. Even if I hadn’t been there on what seemed like a fairly dull school trip (there’s young Bernadette getting it wrong again) I would be able to picture the place. Less usually this book also has some quite deep character development and displays a lot less of the casual bigotry towards Bony than is standard for the series. Whether they know him to be a policeman or believe him to be a vaguely shady stockman (having been arrested after all) Bony is treated with warmth by most of the townsfolk. Of course that’s as it should be but this is 1945 and it isn’t always the case for Bony. Just as he is accepted by the townsfolk he quickly grows to like them too, especially the young daughter of the town’s police Sergeant. Rose Marie is a clever and engaging little girl and her conversations with Bony are a highlight of the novel. The story is more standard for the series in that it relies heavily on Bony’s skills as a bush tracker as well as his deductive reasoning to move things along. It starts out fairly slowly but its ending is dramatic as the novel’s cutest character is in peril which worries Bony and the reader in equal measure. The resolution is well enough reasoned but is nothing short of peculiar, at least with respect to the motive it supplies for the killer, and I think falls into the “each whodunit has to have a more bizarre puzzle than the last” trap. One of the things that identifies DEATH OF A SWAGMAN as belonging at least to a different era if not the actual year 1945 is the amount of smoking that takes place. Eh gads it’s continuous!. But one thing I noticed by its absence was any discussion of the war. If there were any returned soldiers or war widows or elements of that nature mention must have been rapid because they entirely passed me by which does strike me as unusual for a book published in 1945. Or perhaps it is only distance that has assigned that period only one significant event? Overall though I found this a thoroughly entertaining read and I’d recommend it as a great introduction to the Bony series if you’ve never tried it before. If you happen to be a fan of audio books the narration by local actor Peter Hosking is a delight: really bringing to life Upfield’s authentic contemporary dialogue. I enjoy participating in the Past Offences monthly classics challenge to read a book from the nominated year but am rarely able to track down an Australian title in time. 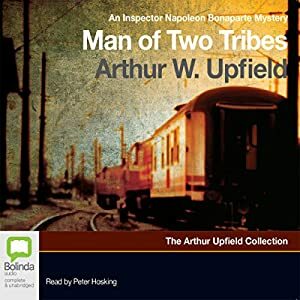 Happily for 1936 there was a relatively new narration of Arthur Upfield’s eighth novel* available for my ears. A reviewer’s caveat: When I first started reading crime fiction seriously as an adult I naturally looked for local authors and it wasn’t long before I found an Arthur Upfield novel but I have to admit I didn’t read many. Partly this is because they are at heart not my thing (my younger self’s crass summing would have been they consist mostly of country people banging on about boring country people stuff). But partly it is also because they make for uncomfortable reading. Although Bony is depicted with as much intelligence and crime-solving skill as any of his worldwide fictional counterparts, some of the attitudes he encounters – the thoughts and feelings expressed by many of the white characters towards any of the books’ Aboriginal characters – are awfully bigoted. My younger self was quite OK with leaving the past behind and believing (hoping?) we’d all moved on a long way from that sort of thing. As well as being a whole lot less naive, older me is able to place the novels in context a bit better and I can deal more philosophically with the wincing that the attitudes induce. Though as there are still a lot of country people banging on about country people stuff the novels are probably never going to count amongst my favourites. On to the actual review: A small plane is found abandoned in remote Queensland. There is no sign of a pilot but a young woman, who appears to be in a coma, is found within. She is removed and taken to a nearby station (similar to an American ranch) where she is looked after by the owner’s daughter though she fails to recover and hovers near death. 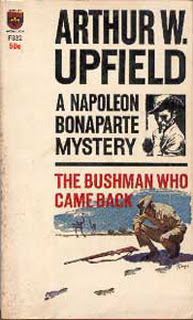 Inspector Napoleon Bonaparte, the part Aboriginal, part white policeman known to all as Bony who has developed a reputation for solving mysteries of the outback, is called in on the case and must act with unusual urgency if he is to provide information to aid the young woman’s recovery as well as catch the culprit. The fact that the plane has been all but destroyed by fire before Bony can inspect it adds to the mystery and results in Bony, and two local Aboriginal men, having to use all the tracking skills at their disposal. 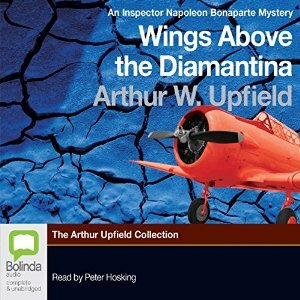 Even today the far western Queensland location in which the events of this book take place provides one of the most isolated inhabited spots in the world and WINGS ABOVE THE DIAMANTINA takes full advantage of this unusual setting. Distances are vast, people are of necessity self-reliant and mother nature has a way of letting them know that even if they think they know what they’re doing she can always surprise them. It’s a toss up whether the cloying sand cloud scenario that develops at the novel’s half-way point or the the dramatic rain storm that occurs near the end is the most memorable natural phenomenon but I bet most readers remember at least one long after the novel is over. As far as the book’s setting in time goes there are plenty of things which identify it as being between the wars but in a way the remoteness of the location makes the novel seem less dated than it otherwise might. 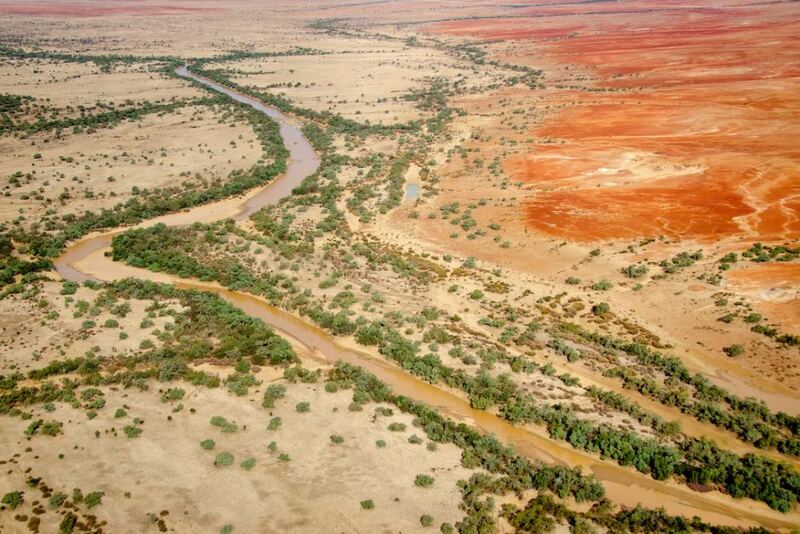 Even with modern communications and technology remote Australia is still a pretty inhospitable place and it is not too hard to imagine a similar kind of story unfolding today. Almost all of Bony’s first encounters – either in this book or others – involve some form of astonishment on the part of those he is meeting for the first time. I can’t help but wonder if such a man had existed in real life he could have been quite so jovially accepting of other people’s low expectations of him as Bony is depicted as being. 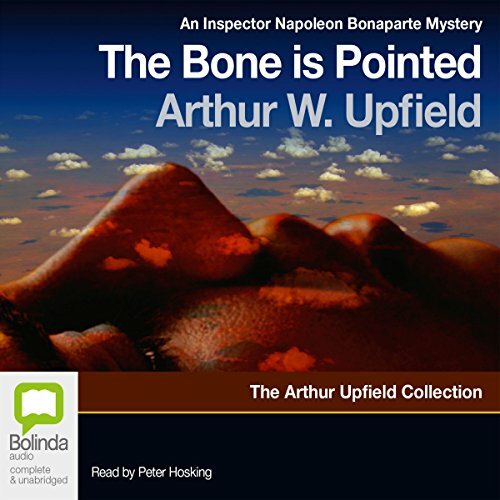 For all his unique qualities though Bony is at heart very similar to the other crime solvers that populate this era’s whodunnits – Poirot et al – in that it is his particular intelligence and way of seeing the world that allows him to solve the puzzles others cannot. For me the plot of this novel was its weakest element. Some of it is annoyingly blokey (there is a thread in which a chap falls in love with the comatose woman which I found truly creepy) and I found my mind wavering a little during some of the minutiae of the investigation. It relied on a visual imagery of relative distances between various locations I couldn’t quite imagine and was heavy on the detail for some things I couldn’t summon much interest in (I wonder if any of the physical versions of the book have a map, it would definitely benefit from one). Perhaps I am truly gruesome enough to require a dead body for my crime reading senses to be completely engaged? 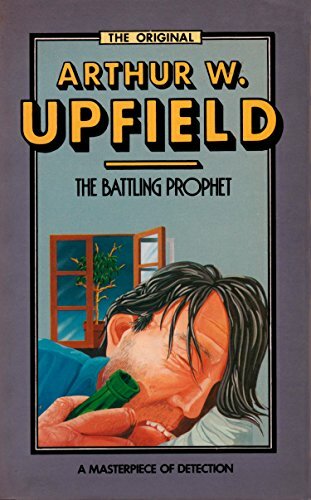 That said I did enjoy the novel much more than I thought I would based on my younger self’s reading of other Upfield books. The author’s genuine affection for his adopted country (he was born in England and moved here at the age of 20) is obvious, though perhaps he owes his his unusually (for the time) enlightened attitude towards our indigenous people to the fact he was not Australian by birth? Regardless of how it was developed it is clear from the warmth and realism with which he depicts them that he has met and grown to really know people like the fictional black fellas he has created here. 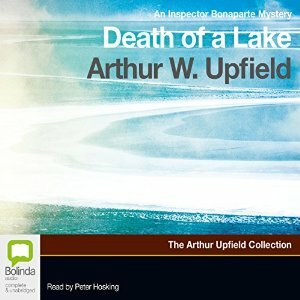 The audio format: I know this format isn’t for everyone but if you are a fan I highly recommend local actor Peter Hosking’s narration (of this and the many other Australian titles he has narrated over the years). This is a novel dominated in part by dialogue and Hosking does a superb job with the different cadences and speaking styles of the disparate characters and it really does add another layer of depth to the story.